Born in India in 1953, Amma (Mara Amritanandamayi) has traveled around the globe preaching compassion and dispensing hugs-an estimated 30 million of them, in fact. 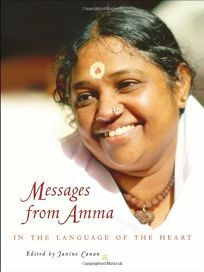 In Messages from Amma: In the Language of the Heart, Janine Canan has gathered some striking quotations from Amma's talks, songs and writings. The short, pithy reflections are organized thematically around topics such as the divine mother, spiritual education, surrendering the ego and seeing the good.